Google Map Saver is a useful application that allows you to save the maps from Google Maps with the configurations of your choice. We're sure that more than once you have wanted to save a map and the only that you have managed to do is capture the screen. With this free tool you'll be able to save them without any problems. If you want a map from Google Maps, first you'll have to tell Google Map Saver the area on which the map has to be centered. After that, you have to indicate the kind of map that you want: maps, satellite, hybrid or terrain. After you click on the GO! button, the map that we're looking for will appear. To save it, we'll have to select the format and the place where it's saved. The formats in which we can save the image are: JPEG, PNG, BMP and TGA. GMS also allows us to select the resolution of the map among a wide range of options or the zoom level that we want to apply. 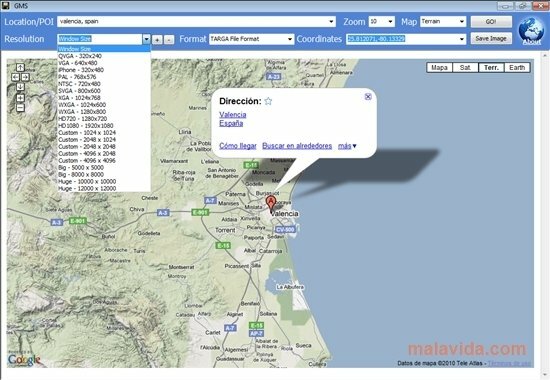 Furthermore, it shows us the exact coordinates of the locations that we have indicated. 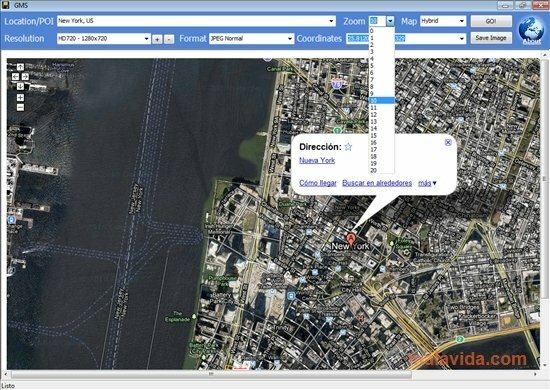 This tool will make things much easier, and we can save maps adjusting their features to our needs. To remove the watermark you have to visit the programs About section.